Michael shares a couple of the meals he discovered with friends. You know how it is sometimes. You look in the fridge and see that block of Stilton cheese that looked like a good idea at the deli. You may have no idea what to do with blue cheese, and the thought of eating it straight, is quite daunting. Recipes for blue cheese do not even compute in your mind. 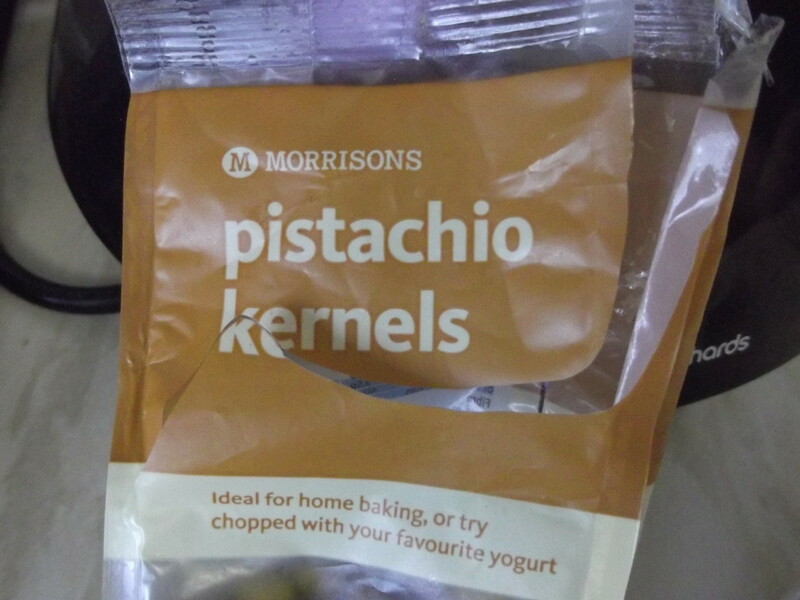 Then you look in the cupboard and see, a couple of forlorn looking half bags of walnuts and pistachios, that were left over from a previous recipe. They want to be used up and freed from the darkness of the cupboard. Suddenly your eye catches a few pears looking a little lonely in the fruit bowl. The stinky Stilton, poor pears and knobbly nuts, all cry out to be released. 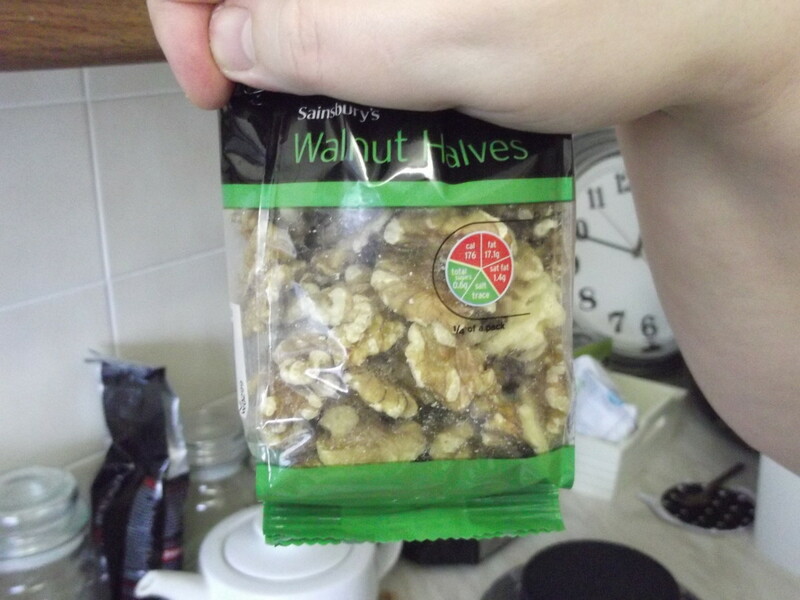 You may well have had walnuts in a salad. Or maybe even in a cake of loaf. But how about a quick quiche? Among all the recipes for blue cheese, this one is a winner. It seems like the combination from hell. Stilton, Pear, Walnuts and Pistachios even Google hates it. It's almost a Google-whack, it is so search unfriendly. You may search in vain, trying to find a recipe that includes all these leftovers, and realise that there are none. So by complete accident we found a niche, that was completely empty, and we had just the recipes for blue cheese, cooking pistachios and walnuts and pears. Inspiration comes from many places, this recipe came about from some leftovers from a previous recipe, for a banana and walnut loaf bread. 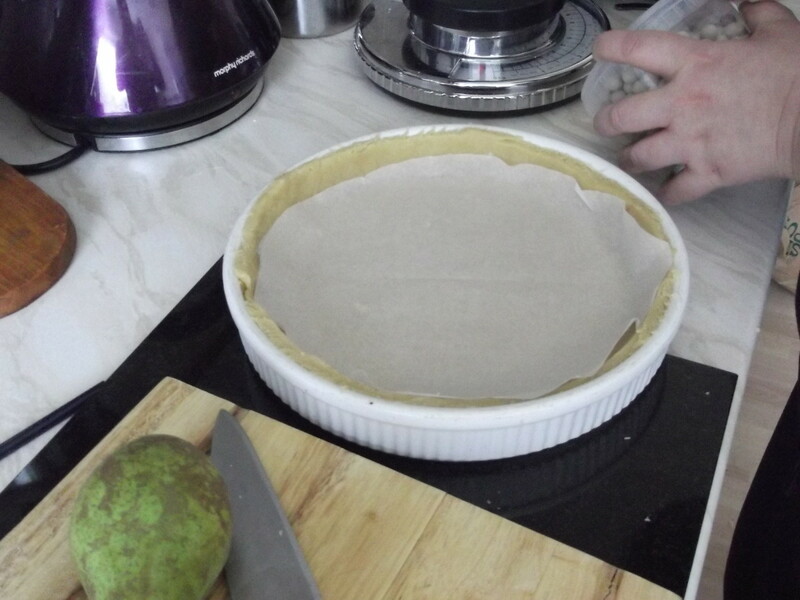 We made some shortcrust pastry, added a few nuts and some spare pears, that no-one was even attempting to eat. The Hairy Bikers (Two TV Chefs) on BBC TV, had made these little tartlets and they looked really interesting. We thought why not adapt that idea, with different ingredients and do it on a much larger scale. So in other words we ended up with something totally different. We must however give credit to the Hairy Bikers, for setting us off thinking in this direction. When you allow yourself to follow along these other pathways. It is surprising what you can discover. I think we may have created a brand new dish. 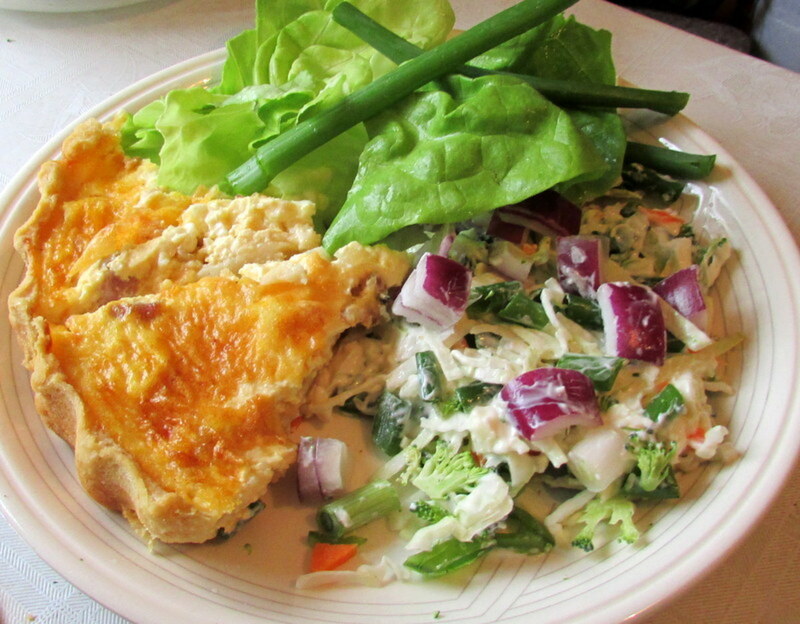 A quick quiche using 4 ingredients that rarely would be combined together in a main dish. Stilton and pear is a common combination for dessert but not baked with nuts and a creamy filling and served as a main meal, that's for sure. We discovered that when the stilton cheese is baked, it loses it's pungency and strength and becomes quite mild. We made it, and to our complete surprise and delight. It tasted great and was gone in no time flat. Which in our world is the acid test of any recipe. We call it 'plate time'. In other words, how long doe's it stay on the plate? The faster it disappears the more successful the recipe. Combine the flour and butter into a bowl, and rub together to make a crumble breadcrumb type mixture. Add the egg, and mix together until it combines into a dough like consistency. This can also be done in a food blender. NB. We had to add another egg in order for the mix to bind together. The eggs were rather small though. For the pastry, blend the flour and butter in a food processor until the mixture resembles fine breadcrumbs. Add the egg and pulse until the mixture just comes together as a dough. Take the dough and knead it slightly into a round ball shape, wrap in cling film and put in the fridge for 30 minutes to rest. On a lightly floured rolling board or worktop. 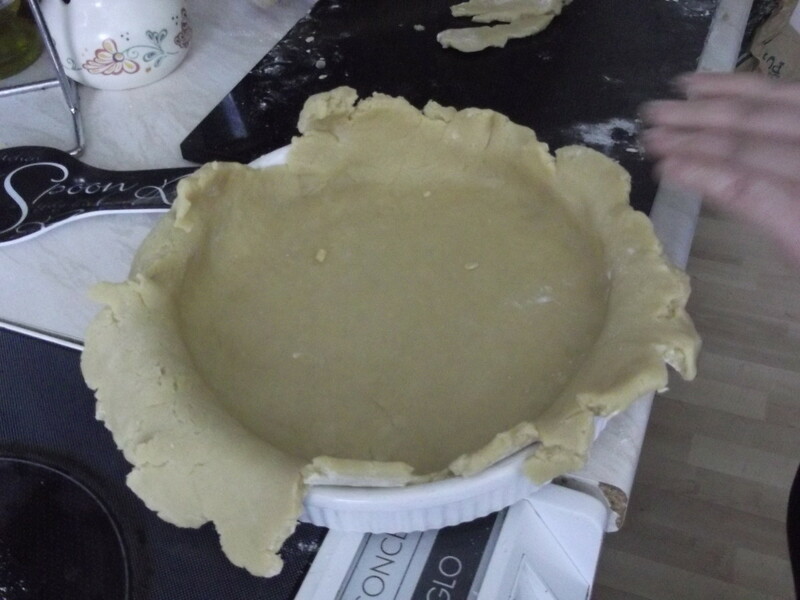 Roll out the pastry to a large square shape and place in a greaseproof paper lined baking tray. 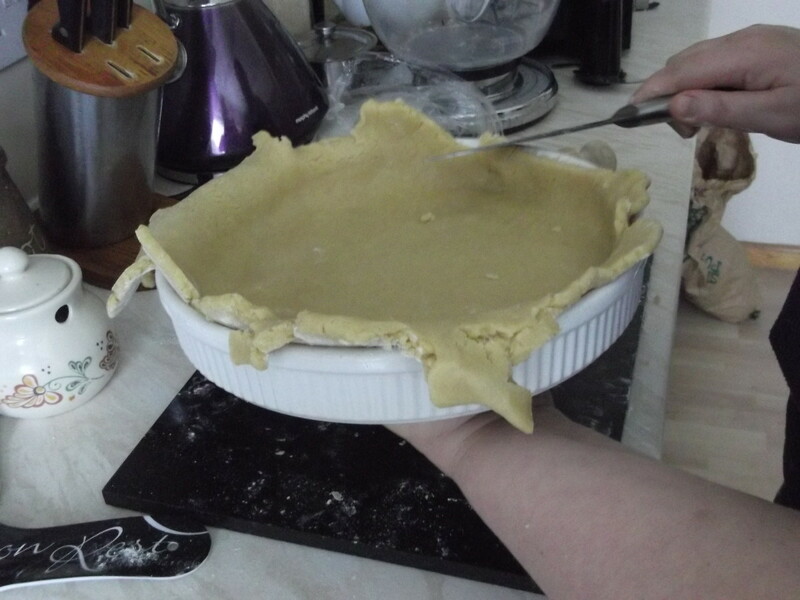 Cut around the edges to trim off the overhanging pastry. 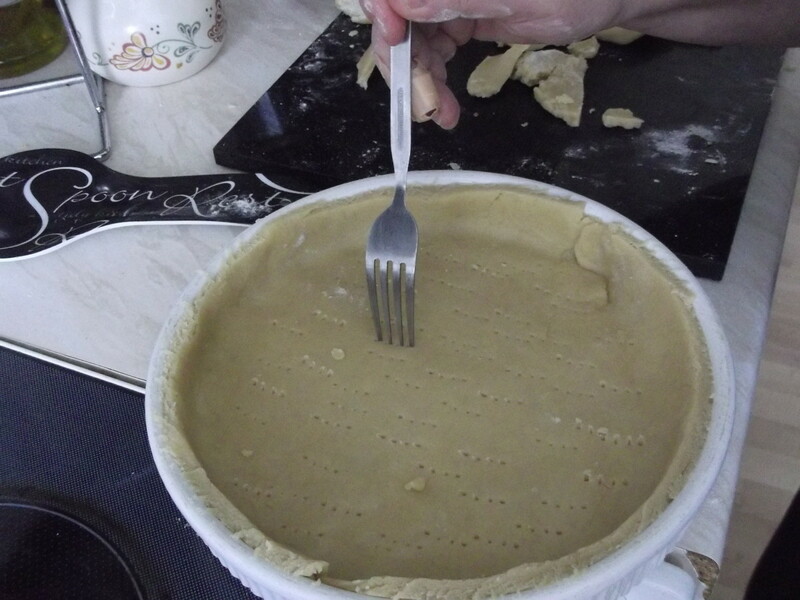 Using a fork prick the pastry to allow air circulation as this will stop it from rising when cooking. 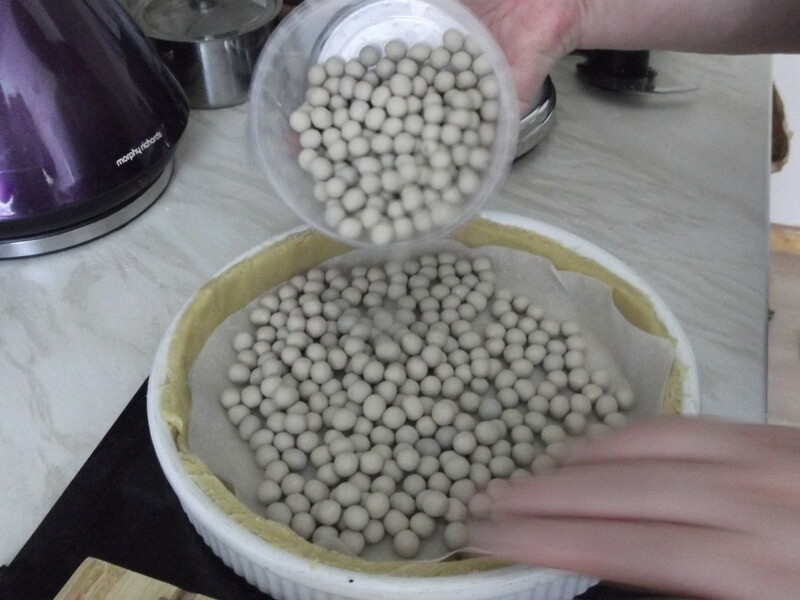 Pour in enough baking beads to cover the whole surface of the pastry. Save any excess pastry for another smaller quiche or other recipe. Preheat the oven to 200C/400F/Gas 6. Bake for 20 minutes, then remove the baking beads and greaseproof paper and place back in the over for another 10 minutes at 170C/325F/Gas 3.or until the pastry turns a light brown colour. Cookers vary so keep an eye on it occasionally. Fan assisted ovens will be faster. 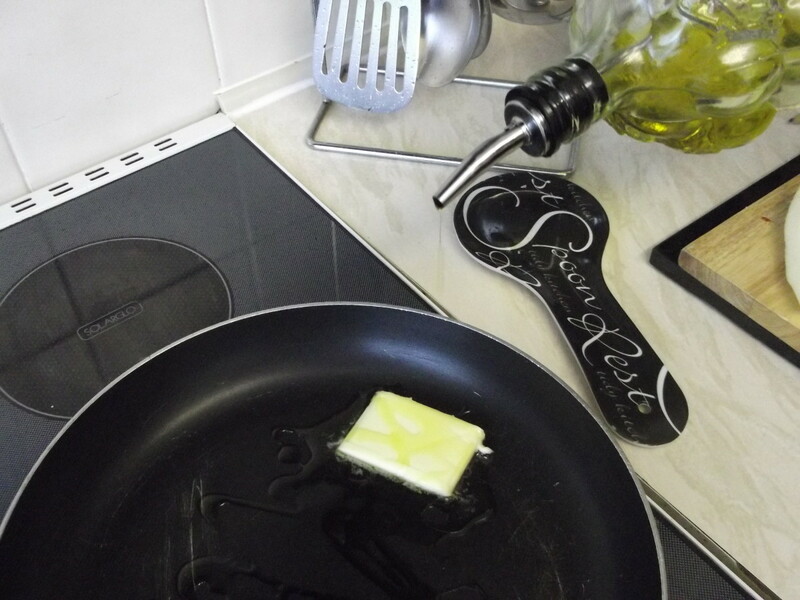 Add the butter and oil to a large non-stick frying pan. 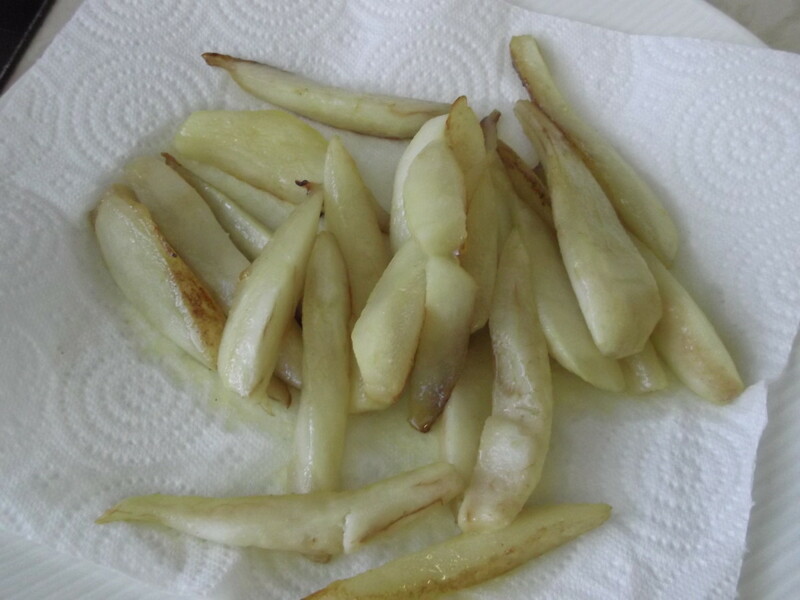 Fry the pear slices for 1-2 minutes until lightly browned all over. 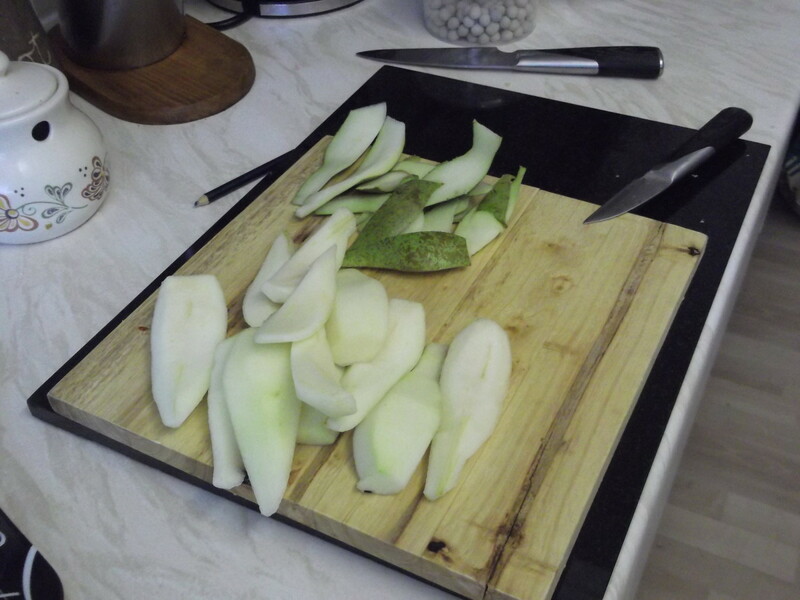 Place pear slices on kitchen paper towel to soak up excess juices. 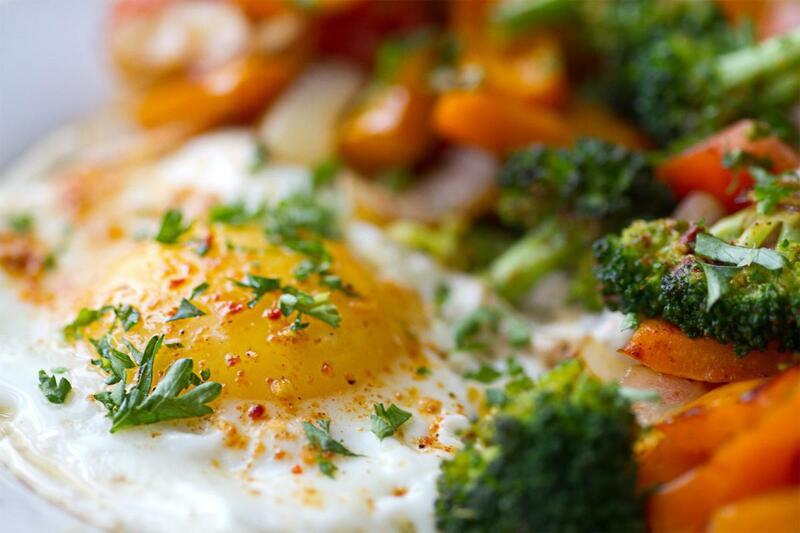 Combine the eggs, cream, and crème fraîche, beat until smooth. Add salt ground black pepper to taste. Break up and crumble the Stilton into the cooked pastry lined, baking tray. 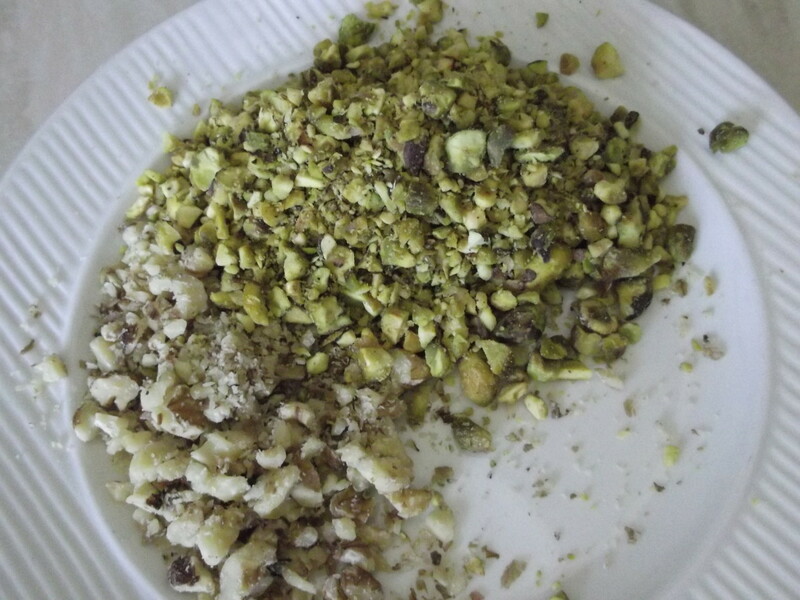 Add in the lightly browned slices of pear and sprinkle over with the blitzed walnut and pistachio pieces. Carefully pour over the egg and cream mixture, making sure to fill in between the all gaps in the quiche. 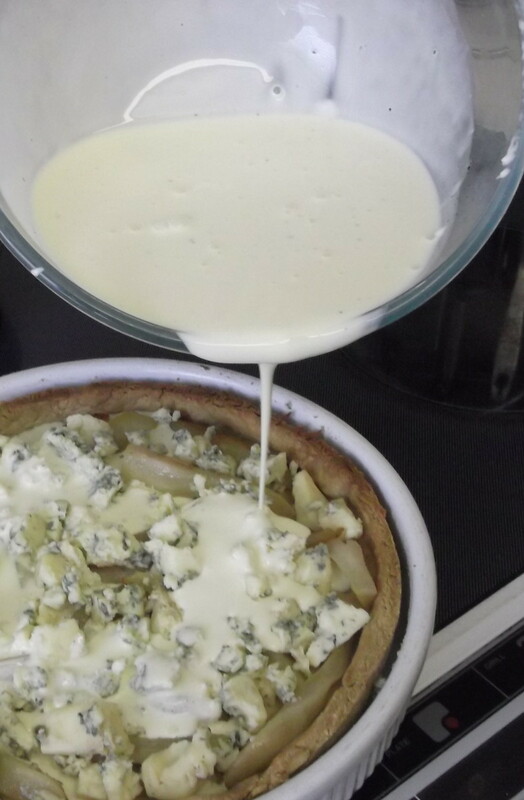 Give the baking tin a little shake, to make sure the mixture fills every space between the nuts and stilton and pears. Bake for 25-30 minutes or until the filling is just set. Remove the quiche from the oven and leave to stand for 15 minutes. Carefully remove from the baking tray and leave to cool completely on a wire rack. This sounds so delicious Michael and I love the sense of humor in the recipe. 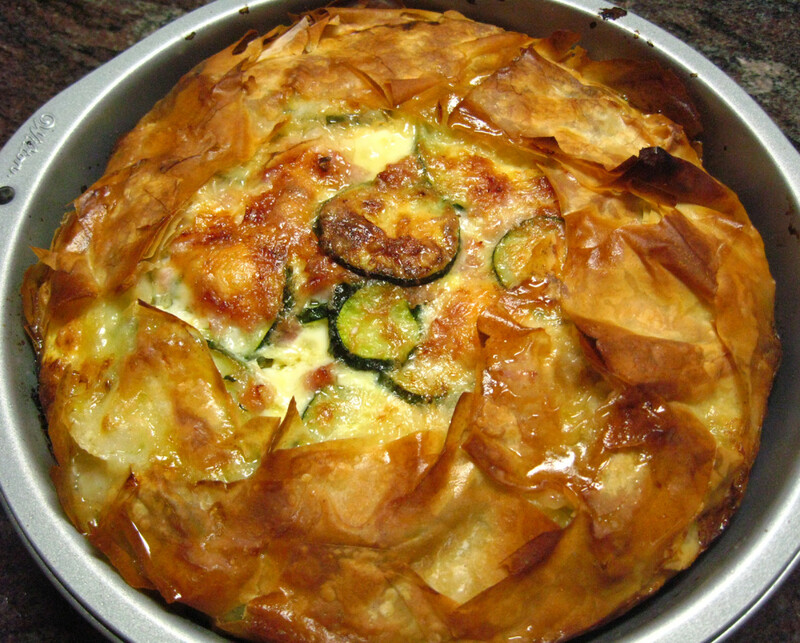 A very creative quiche recipe. Hi Natalie, you can try some quiche yourself in a few days. We will make one. Glad you took the time to read and leave your comment. Much appreciated. Thanks. So glad you found this interesting. It tasted fantastic if I do say so myself. Looks delicious and healthy. Thanks for sharing your recipe. Hairy Bikers beware! Molometer is on the scene. This entire hub is delightful from beginning to end. Your recipe looks scrumptious and I can say this because you've added so many great pictures. You can put a knob of butter on anything, anytime! Voted up, useful, funny, and interesting. Great hub. 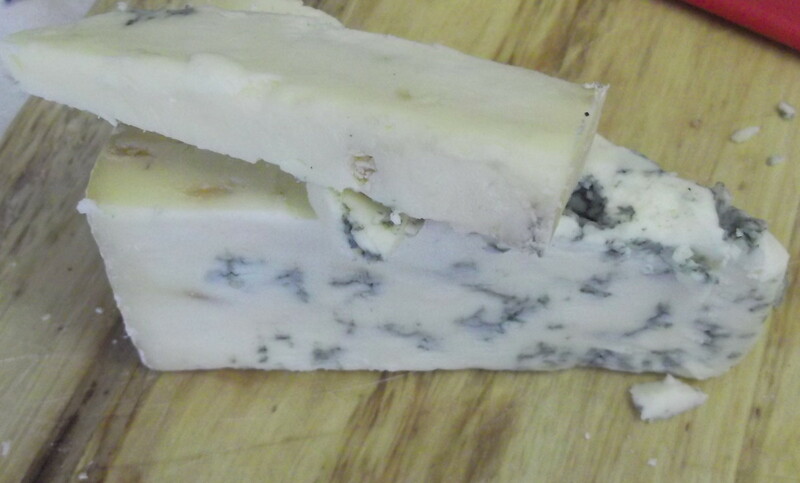 Stilton is 'the original and first' blue cheese. How interesting that people just think of blue cheese. It's a little like the champagne issue. Anything made away from the champagne region can only be called sparkling wine. This quick quiche is delicious. Enjoy. Had to Google the Stilton cheese. Have never heard of it before. 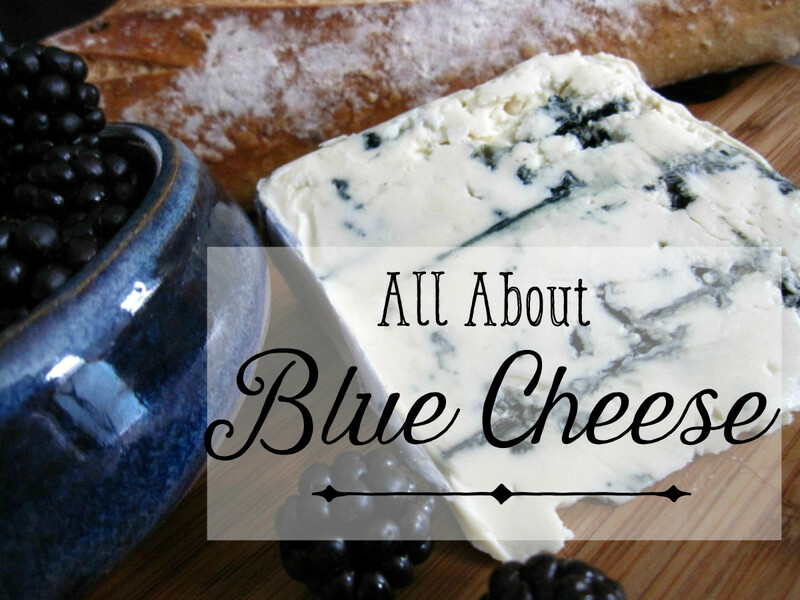 It was the blue cheese that caught my eye in your title. I love blue cheese crumbled into my tossed salad. It's pretty good by itself, too, and I love quiche. Yours looks pretty yummy, and your description just made it all the more intriguing. Will have to give it a try to add it to my quiche recipes repertoire. Tammy you are so funny, what''s a knob of butter between friends lol. I still chuckle when this pops up in the newsfeed... Knob butter.. tee hee! Glad you liked it. It tastes great too and a new twist for a quick quiche. lol, I hope you managed to get to the store today for all the ingredients. Your comment "I want that now! Right now!" gave us such a giggle. Did you like Linda's hand acting? She has great hands for TV lol. We are fine thanks. We had great fun making this recipe and hub. Michael! 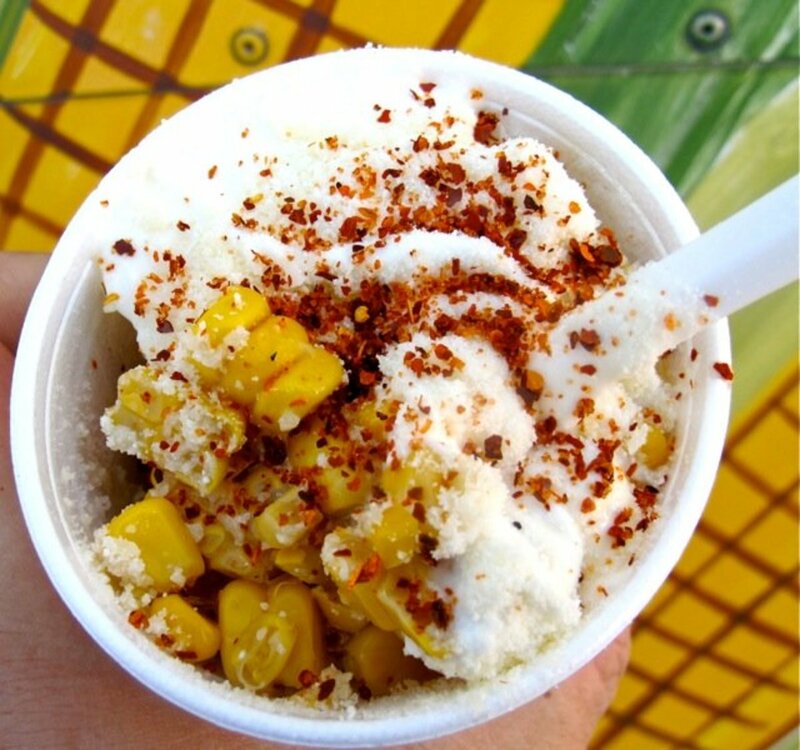 I want one right now! 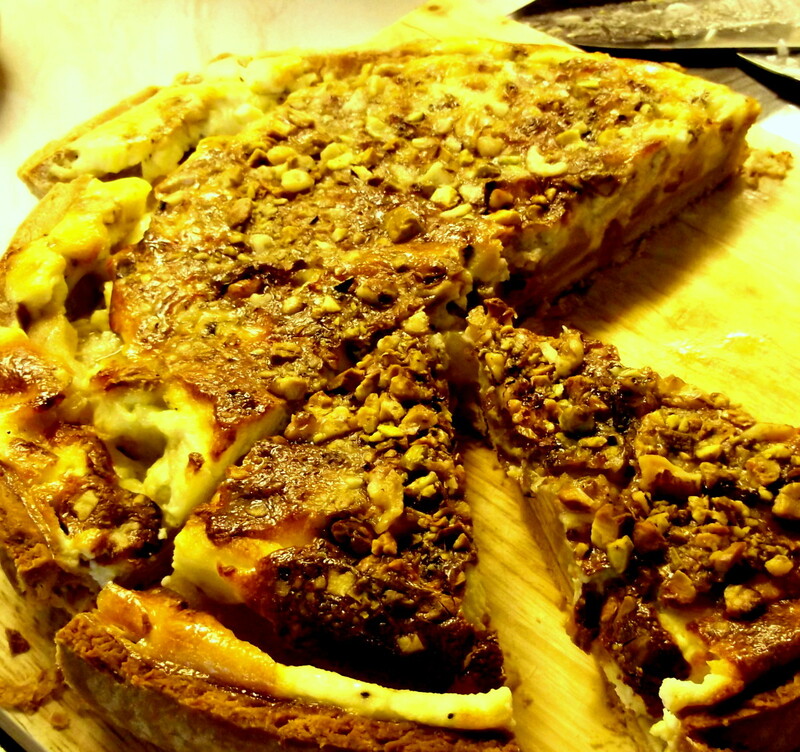 A Stilton, Pear and Walnut Quiche! And I have none of the ingredients. :( Usually when I read a recipe that appeaks to me I think, "I should try that the next time the family comes over." Or maybe, "Why that would really make a great addition to Christmas Eve dinner." But as much as I love food, I don't think I have ever seen a recipe and thought (so intently, it was almost audible) "I want that now! Right now!" You and your divine recipe have created a "first" in my culinary experience. Bravo! Hope you and Linda are well. Hope teaching is still suiting you. My summer classes have begun and are going fairly well. PS I will be going shopping tomorrow on the way home from work. Don't know if I will be able to sleep tonight. Oh, my. It was a great giggle, making this recipe up. Thanks for the heads up. I completely missed the typo. I was probably laughing so hard at the time. Glad it gave you a laugh too. Nice to know it worked. ha ha ha. Ha ha ha ... I love the way that you set the scene for this! What a weird combination, but then it is often the weird mixtures which as surprisingly good. Shared, tweeted, up and useful. Thanks Femme, we aim to please lol. It was great fun putting this together too. 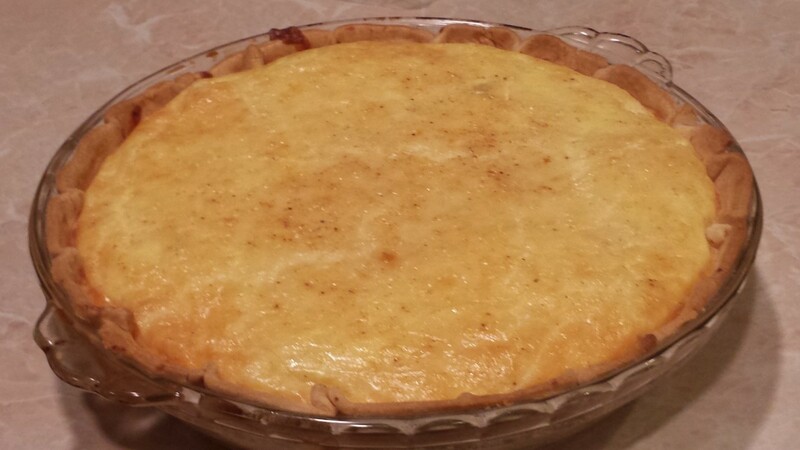 The result was a great quiche and smiles all around. Beyond it being a brilliant recipe idea, you've had me cracking up while reading the article. Fornlorn nuts, stinky Stilton and poor pears, combined with a knob of butter ... you had me feeling sorry for nuts and fruit, and I've never heard of butter amounts being referenced with the word "knob". I loved it, lol! Vote up and passed around! I suppose most people associate quiche with quiche Lorraine or similar. The actual term 'quiche' refers to the flan case itself, which is then filled with a savory filling and thickened with eggs. It is different and totally delicious. Hope you give it a try. well this quiche might be different but it looks wonderful. I love quiche any way.. It was an inspirational moment. Nut in a quiche! sounds odd but tastes divine. What an interesting combination -- never thought to add my favorite nut as a topping for quiche. Voting this Up and Useful. SHARED. It is an unusual combinations but they work really well together. The proof is in the eating. It was gone pronto :) Enjoy. Let me know what you think. 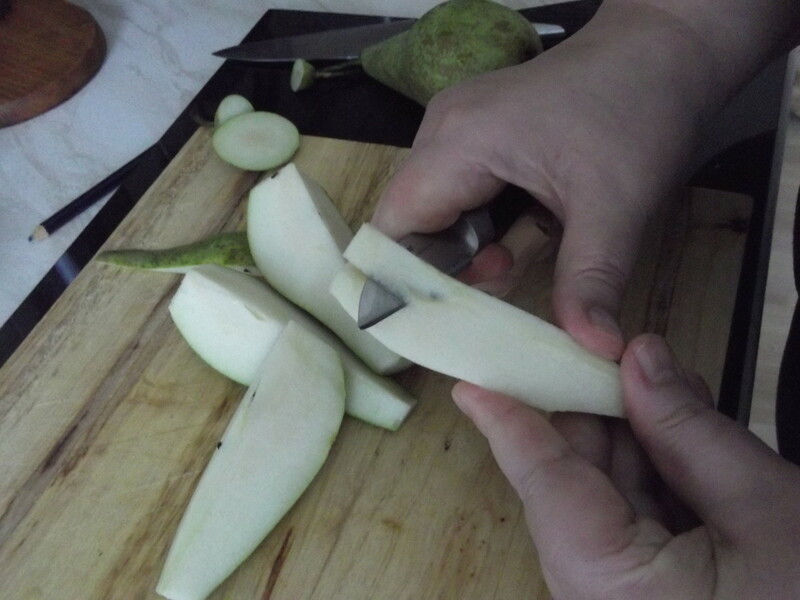 What a great idea for lonely pears and daunting Stilton! I love your opening paragraphs. 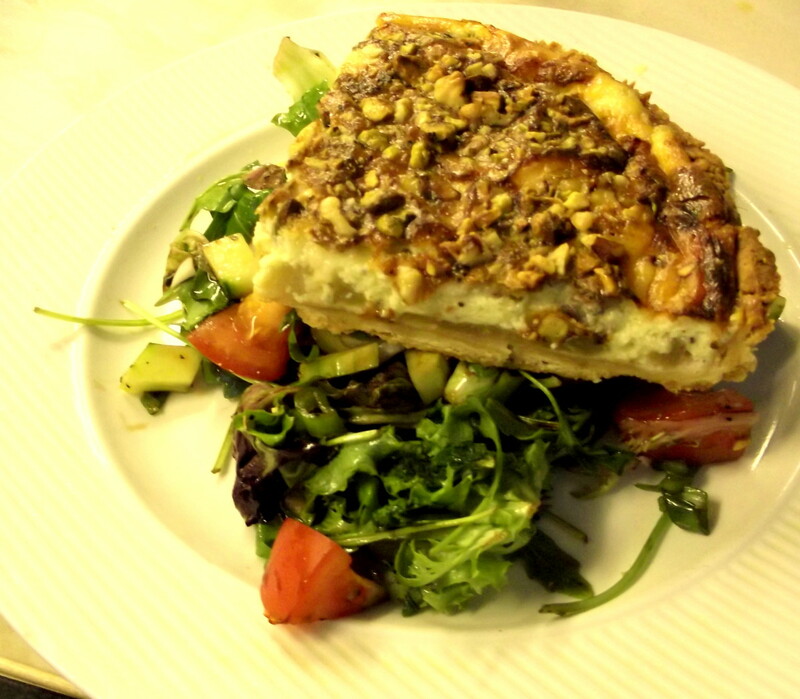 We love blue cheese, walnuts and pears but wouldn've never thought to bake them into a quiche....or to add pistachios. I definitely need to give this one a try! I am so glad you clarified that Molometer. That could have some naughty connotations here... I won't defile your wonderful recipe... but.... I had to ask.. ROFL!!!! Just one wd - YUMMYLICIOUS. Thanks for sharing. 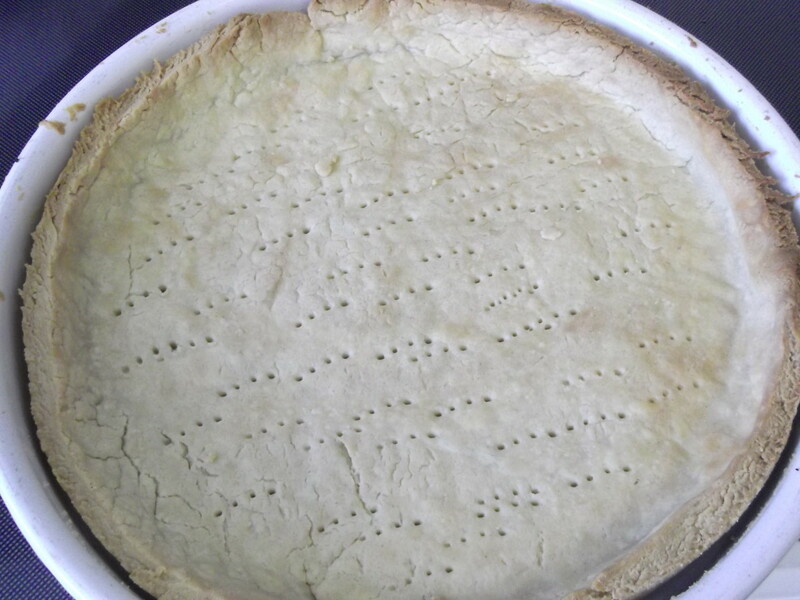 It is a basic shortcrust pastry. It is so easy to make. Probably quicker to make than going to the shop. The hairy bikers made these tiny little tartlets, with the stilton and pears. 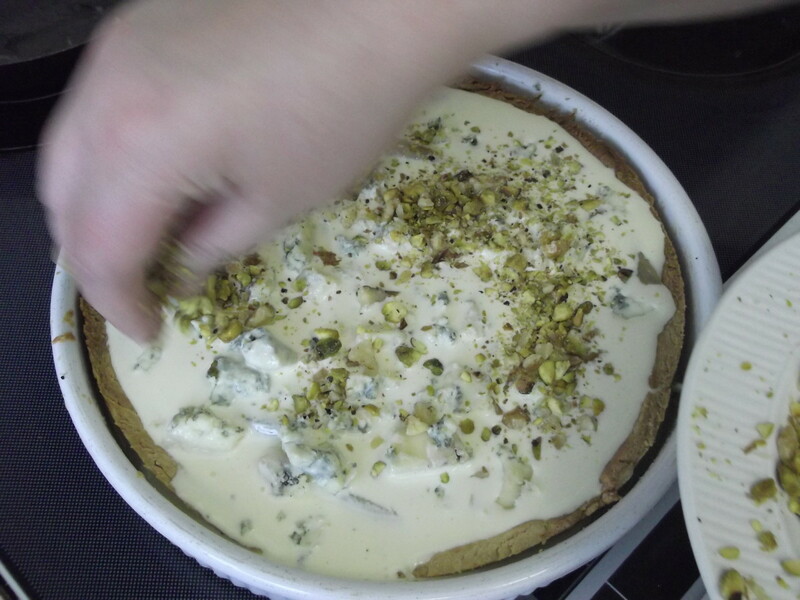 We added the walnuts, pistachios and cream and baked it in a large quiche tray. All I can say is that it did not stay on the plate long. It was gone in a flash. As a quick quiche, from basically a bunch of leftovers it was truly amazing. Hope you like it. Me too, individually there are all great ingredients. Combined they are incredibly good. Give it a try. A knob of butter is, more than a smidging and a little less than a tad. Or in old English a tablespoon of butter. There is a picture of said knob. 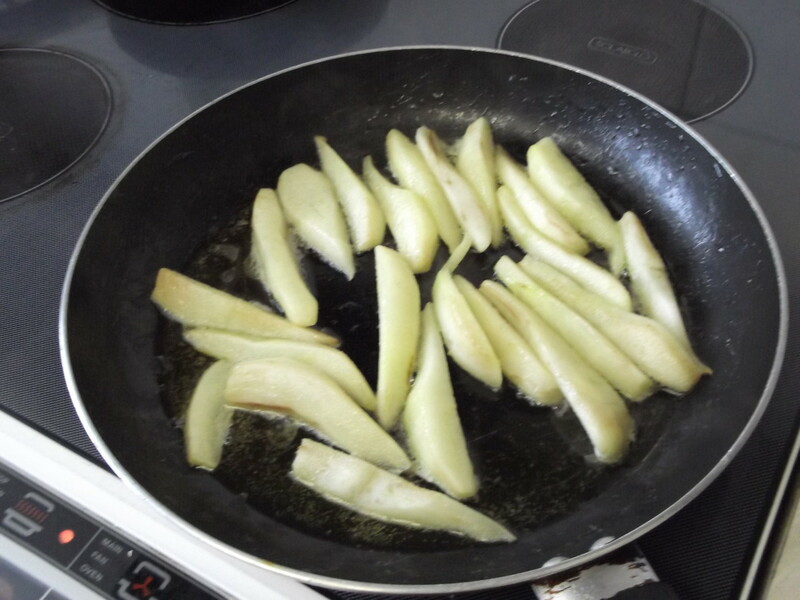 In the frying pan with the olive oil waiting for the pears. Give it a whirl. If you like savory. I think you will like this. The stilton loses it's pungency when baked. Enjoy. Hi molometer, how interesting! I have watched some of the "Hairy Biker" series but missed the inspiration for this. I love all the ingredients so must give it a go! Which pastry can I use pre bought? Thanks for sharing voting up, interesting! This sounds very tasty. I like Stilton cheese, pears, walnuts and pistachios individually, and I love the thought of seeing what they taste like when they're mixed! Thank you for the recipe. For us Americans, what is knob butter? This is really creative and I think fried pears would be good. Over here we have Paula Deen. You guys have the The Hairy Bikers. Wow! This is a very interesting hub with a lot of English flair. Love it! I may have to try this, I love interesting combinations and this sure sounds like one! Great photos and instructions. I am going to give this a try! Thanks! 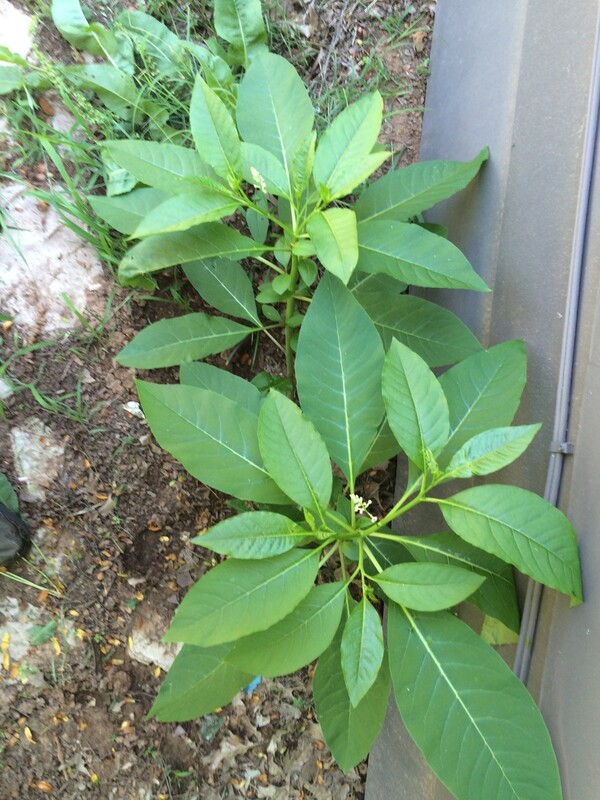 Thank you ishwaryaa22 for your warm comments. My wife Linda must take the credit for the cooking and the idea (again : ) . Hope you give it a try sometime. It is pretty simple and tastes great. It really is worth it. It makes good use of items that would probably sit in the cupboard for ages. Okay I will give it a whilr. I do love blue cheese! Your pictures are beautiful! The photos look delicious and well captured that they look like they are from an established cooking magazine! I have tasted savory quiches and like them. I also like nuts, cheese and pears. Your instructions, photos and video are precisely explained. Thank you for introducing this unique quiche recipe. Well-done! Thanks for SHARING. Useful & Interesting. Voted up and Socially Shared. Different is the right word. It was inspired. Blue cheese loses it's strength when baked. It tastes great. This is very different than my quiche. It does taste yummy though? Promise?